The Year 6 teaching team this year comprises of Miss Harris (Deputy Head) and Ms Wells (who will cover the class on Wednesday and Thursday afternoons) with Mr Bowden-Green in support. Check out our Be Ready guidance which outlines the skills and responsibilities expected from our pupils as they enter each new class group. Year 6 pupils can choose from KS2 Athletics, Cookery, KS2 Homework, Tennis, Y5/6 Football, Dance and Art & DT clubs. At Garsington all pupils, staff and parents are encouraged to have a growth mindset. Check out ideas and guidance on how you can achieve this via the Growth Mindset page. Homework is of increasing importance in Year 6 and I will expect all children to hand in their homework on time each week. Two pieces of work (usually English and maths) will be handed out on Friday and will be due in by the following Tuesday. As the term progresses, look out for ‘On the Boil’ homework, which will contain a few questions (generally maths, spelling and grammar) to revise the points we’ve already covered in previous weeks. In addition, the children will have a weekly spellings and times table focus, spellings need to be learnt by Thursday, times tables by Wednesday. Please remember that learning number facts for greater speed and fluency is every bit as important as completing written tasks. Two pupils from each year group in Key Stage 2 are chosen as Learning Detectives for the term, coming together weekly as a group with the Headteacher to discuss and help with class and schoolwide learning challenges. In Year 6 pupils must pay for school dinners which cost £2.30 per day (if you think you are eligible for free school meals please contact the School Office). Caterlink are our new suppliers. Check out their current menu. · White polo shirt or plain white T-shirt; plain dark shorts; and trainers (plimsolls are optional for indoor wear). · Tracksuits are permitted during outdoor PE . · Long hair must be tied back during all PE lessons. -Small studs must be taped or, ideally removed for PE . Children should bring their own Microporous Surgical Tape to school in a clearly named box. In Year 6 pupils are given extra responsibilities around the school by acting as prefects. We have Lunch Prefects, Headteacher's Prefects and Playground Prefects. Prefects change each term and are appointed via interviews with the Headteacher. Please read to or with your child for at least 10 minutes every day. Books can be taken home from the class library. Please ensure your child has a book which is challenging enough. For details of all the curriculum subjects we will be studying this term please see the relevant topic web below. For further information on our upcoming SATS please take a look at our SATS Powerpoint. Weekly spellings are tested on a Thursday. Year 6 pupils will be swimming as part of the National Curriculum during Term 6. 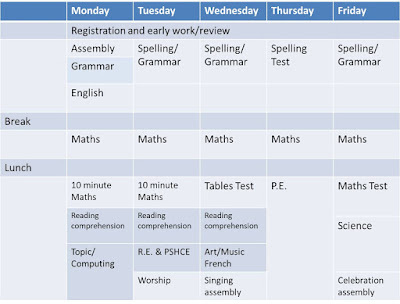 This is our standard timetable for this term. Some lessons may change. Times tables are tested on a Wednesday. Parents are reminded that pupils should not wear nail varnish or any jewellery—with the exception of small ear studs and watches. For the sake of our carpets, please don’t forget indoor shoes. Children are encouraged to bring in a water bottle, but are reminded that they should only drink water in class. The children may also bring fresh fruit or vegetables to eat during morning break, but they will not be allowed to eat any other snack.